Set in the Serino woods of the Picentine mountains, just below Avellino, sits a mysterious set of ruins, the walls of the Civita (city) di Ogliara. I'm not sure if it's all that mysterious, but a lot of persons over the years have wanted it to be, so let's see. 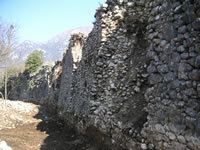 The walled site is now the centerpiece of the Archaeological Park of Ogliara, within the Picentine Regional Park (the green area, image, right), at 615 meters/1845 feet a.s.l. in the upper Sabato river valley, thus in the area that in ancient times made up Hirpinia, roughly the area of the modern Italian province of Avellino. The inhabitants, the Hirpini were one of the pre-Roman Italic tribes, off-shoots of the Samnites, a parent group of many southern tribes that spread out in Italy as this particular branch of Indo-Europeans expanded. (Music lovers, I used to think that Igor Stravinsky's The Rite of Spring centered on the rituals that drove this expansion. Great bassoon solo at the beginning!...but, alas...) In any event the Hirpini were already established in the mountains around Avellino by 350 BC. They spoke Oscan (a sister—or maybe cousin—of Latin. Their name, Hirpini, comes from the Oscan word for 'wolf', the tribal totem and the creature that led them to these mountains, they say. So, to the mystery of Ogliara. The site has been the focus of intelligent anthropology since around 1900 and of modern archaeology and even reconstruction since the 1970s. By now, the standard short descriptions tell you that the Civita d'Ogliara was a Longobard castrum (castle, fortress) possibly built on the site of an ancient Hirpini settlement called Sabatia (or Sabatium), mythical home to the original inhabitants. The descriptions then emphasize that the mythical part is almost certainly just that. No one knows. That's why it's a mystery. 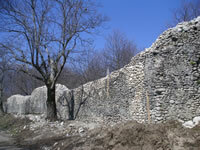 The physical evidence, as it stands today, is that the wall of the castrum is over two km in circumference. 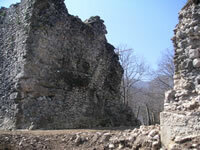 The walls present towers and two prominent gates at the NE and SW. 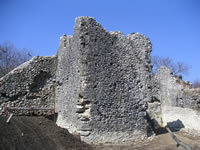 The ruins show evidence of the reuse of Roman materials, particularly a rectangular stone block, originally part of a mausoleum. 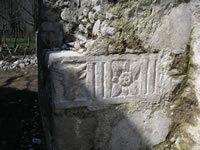 The block (image, left) is engraved with the image of a bull. It's not a lot to go on, but here are the theories that try to explain what it all means. I have listed them with the least likely ones first. All of these are dealt with at length in Storia di Serino by Filomeno Moscati (2005, Edizioni Gutenberg, Penta di Fisciano, Salerno). (1) – The silly one first. 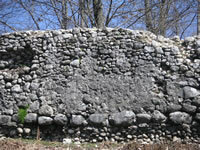 From a scholar, Piobati, in 1820, who says that the site is even older than ancient Hirpinia. It was, in fact, built by the Trojans who accompanied Aeneas to Italy after the Trojan War. You can add this one to all the other sites (besides Rome) that make similar claims. (2) - It is, in fact, the original city of Sabatia, “mythical” home of the Hirpini. The thing wrong with this theory is that there is no evidence for it, even if we like the idea that mythology is, in some fashion, connected to fact. It is strange, indeed, that there is no mention of a Sabatia or Sabatium or a city of the Hirpini in the writings of any ancient Greek or Roman historian. (It is true, though, that a lot of ancient writings have not survived.) There is one single reference by Livy (60 BC – AD 17) (in Ab Urbe Condita, XXVI,34) to a Sabatini people: “...Campanos omnes Atellanos Calatinos Sabatinos...” [all Capuans, Atellani, Calatini, Sabatini...]. That's it. In all of the ancient writings that we have, that is the one reference to a people in Campania whose name may have something to do with the local river, the Sabato, but there is no mention of a city. That idea that there was even an ancient city called Sabatia at all seems to have surfaced among Italian writers of the 1500s and 1600s. -(c) or it may have been destroyed the Social War (98-88 BC) by the dictator Sulla. Again, these are unattested, meaning there is no ancient document that actually makes those claims. (5) The winner. The Civita d'Ogliara is what most scholars since the late 1800s and early 1900s, including Francesco Scandone and Theodor Mommsen, have claimed, and what recent work since the 1970s seems to show: The site was a Longobard fortification. Whether it was anything else before that is likely to remain a mystery, but the Longobard thing is not a theory. It is mentioned in period documents, and is, indeed, interesting. The Lombards invaded Italy from the north in the mid-500s AD and were a loose-knit confederation in virtually all of Italy from north to south for two-hundred years. The northern part was eventually taken by Charlemagne in 774, leaving the south to its own devices. However, that south underwent a civil war in 839, producing a north-south division of its own centered on Benevento and Salerno, respectively. The division was in the hills of Hirpinia. This castrum is apparently one of the fortifications set in the area to mark the borders. (“Good fences make good neighbors.”) The south (Salerno) then developed separately as the duchy of Salerno until taken by the Normans in the 11th century, who also went north to mop up the Benevento portion. All of that, the territories of Salerno and Benevento, is what eventually became the kingdom of Sicily and then the kingdom of Naples (until the unification of Italy in 1861). The only real mystery about the Civita d'Ogliara as a Longobard site is the exact function; that is, was it on one side or the other? Or was it more interesting than that, maybe a shared “border town”? The layout of the two main gates pointing to Benevento (NE) and Salerno (SW) offer that intriguing possibility. There is no real explanation as to why it disappeared, but if was a community connecting both parts of the old Longobard holdings, it may simply have run out of reasons to exist when the Normans took over. Why is there such use of Roman materials (if that is what they are)? It's possible that the Romans had a structure in these hills (although their documents don't mention it). It is also possible that the Longobards dragged that stuff up into the hills from elsewhere. Both possibilities are plausible. You have to live with the uncertainty, the mystery. That's fine. I have always loved mysterious cities—Oz... Shangri-La ...Sabatia.